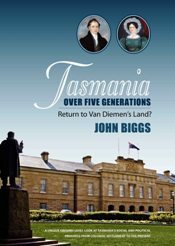 TASMANIA OVER FIVE GENERATIONS: RETURN TO VAN DIEMEN’S LAND? Here are stories about people, time and place. The people are father-son descendants of Abraham Biggs, my great-great-grandfather (pictured in the inset with wife Eliza, courtesy of TMAG), and the place is Tasmania . What do the stories of these five individuals tell us about the Tasmania in which each lived? “… a narrative, placed in its social and economic context, which beguiles and entraps. Why have we not learnt from the past? Why repeat avarice, stupidity and abuse of position?” — Justice Pierre Slicer. “It is rare to find a book that can offer a detailed, deeply involved history of place. Tasmania Over Five Generations achieves this. It is a blend of history, biography and political analysis; a panorama of time and an island. … an important contribution to Tasmania’s literature.” — Island Magazine . “Pater Biggs” opens his bank and his son Reg catches HRH at it. I return to Tasmania to explore the Tarkine but where is it?